Nancy Sadowski of Riverview Studios in Melbourne invited me to teach a four week workshop on how to paint water and clouds. I had to take a quick photo of the group this past Tuesday. What a nice job everyone did!!! 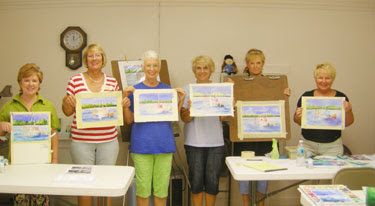 Lots of work, lots of laughs and so much fun producing these nice paintings of a boat in water.